How to forgive someone else? It feels like no easy thing, but it is the most worthwhile thing we can do. 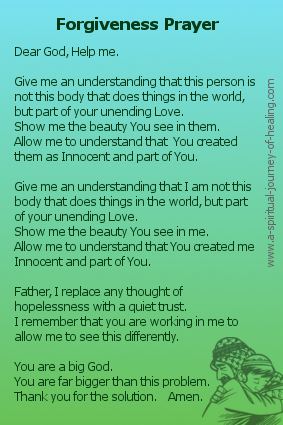 The forgiveness prayer below opens our minds to allow God to guide us in how to forgive someone else, and thus return us to a place of inner peace. A peaceful world will come about from a collection of peaceful people. By allowing ourselves to forgive and move to inner peace, I truly believe we contribute to world peace. Let it be easy to forgive. I am feeling judgement of someone right now. The behaviour which upsets me is this: it upsets me when she/he ________. I feel she/he is different from me. I am thinking that I really need them to change for me to have peace of mind or a healthy body. Or perhaps, I am thinking that I will just have to compromise here. That I have to adapt myself in a way that doesn't feel right to me. I don't know how to be at peace here. the humility you need is my realisation that I can't do it on my own. I allow You to love me complete with this feeling and this thought. I remember that this world is not all there is. I remember that I am not a body, but a part of Your Infinite Love. Dear God, I create a space and I invite you to fill my mind. Do I want to be right about this and stuck in a difficult situation? Or do I want to be happy in the certainty that you are working in my mind to bring me to a place of peace? Dear God, I would rather be happy. Please work in my mind. Please bring Your Peace to my heart. I am willing to see this person as a part of me. I send blessings to this person, in the knowledge that as I give, so I receive. Dear _________, I bless you. Give me a revelation of your Love. Give me a revelation of my Innocence. Give me an understanding that this person is not this body that does things in the world, but part of your unending Love. Show me the beauty You see in them. Allow me to understand that since you created them Innocent, and part of You, that this is what they still are. Give me an understanding that I am not this body that does things in the world, but part of your unending Love. Show me the beauty You see in me. Allow me to understand that since you created me Innocent, and part of You, then that is what I still am. Father, I replace any thought of hopelessness with a quiet trust. I place this in your hands. I remember that you are working in me to allow me to see this differently. You are a big God. You are far bigger than this problem. Along with a spiritual forgiveness prayer, I find the following bible quote on trust very powerful in allowing me to leave space for God to guide me in how to forgive someone. and you direct my path. To all those who visit this page, thank you for your willingness to forgive. Let us keep letting God work in us to guide us, both in how to forgive someone else and in how to forgive ourselves. There is no need to leave your email address in order to comment. Only do so if you want to know if your comment is published. Read a full list of the forgiveness articles on this spirituality website.